Kopi Luwak great coffees from Indonesia are hard to find. Unique characteristics resulting from the unique natural fermentation and harvesting techniques profoundly impact the flavor of every bean. We search for lots that embody the best traits of that growing region in Sumatra and Java Island, and from there we discover the most distinct coffees by conducting multiple cuppings. 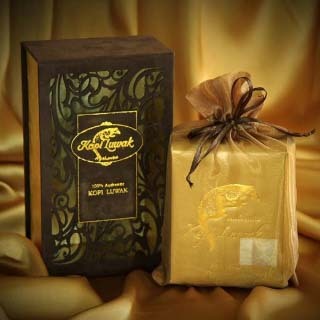 Our patented Kopi Luwak coffee offers certification of authenticity and world standard of health certifications. 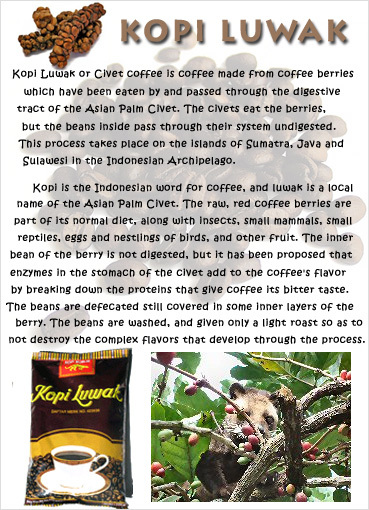 Kopi Luwak or Civet coffee is coffee made from coffee berries which have been eaten by and passed through the digestive tract of the Asian Palm Civet (Paradoxurus hermaphroditus). The civets eat the berries, but the beans inside pass through their system undigested. This process takes place on the islands of Sumatra, Java and Sulawesi in the Indonesian Archipelago, in the Philippines (where the product is called Motit Coffee in the Cordillera, or Kape Alamid in Tagalog areas) and in East Timor (locally called kafé-laku). Vietnam has a similar type of coffee, called weasel coffee, which is made from coffee berries which have been regurgitated by local weasels. In actuality this alleged weasel is just the local version of the Asian Palm Civet. Kopi is the Indonesian word for coffee, and luwak is a local name of the Asian Palm Civet. The raw, red coffee berries are part of its normal diet, along with insects, small mammals, small reptiles, eggs and nestlings of birds, and other fruit. The inner bean of the berry is not digested, but it has been proposed that enzymes in the stomach of the civet add to the coffee's flavor by breaking down the proteins that give coffee its bitter taste. The beans are defecated, still covered in some inner layers of the berry. The beans are washed, and given only a light roast so as to not destroy the complex flavors that develop through the process. Some sources claim that the beans may be regurgitated instead of defecated. In early days, the beans would be collected in the wild from a "latrine," or a specific place where the civet would defecate as a means to mark its territory, and these latrines would be a predictable place for local gatherers to find the beans. More commonly today, captured civets are fed raw berries, the feces produced are then processed and the coffee beans offered for sale. Copyright © 2006-2015 Arcobaleno Italian Restaurant (Italian Food) All rights reserved.